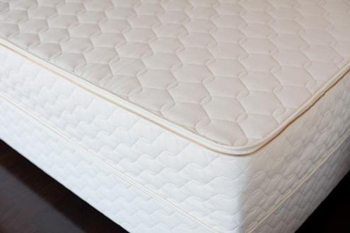 But most importantly, organic dunlop latex and natural rubber talalay latex have a very comfortable and supportive feel, unmatched by any other material. There’s no mistaking the feel of a natural rubber latex mattress. Come in to our store and try one for yourself! These models can be placed directly on a platform bed frame, or on top of a foundation/box spring. See the Nature’s Embrace Foundation Pricing. Of all Savvy Rest dealers in the Pacific Northwest, ECO Sleep Solutions of Eugene, Oregon has the largest selection of Savvy Rest mattresses in its showroom. Savvy Rest organic latex mattresses are made of all certified organic materials. So not only is the organic dunlop latex certified by GOLS, but the cotton ticking and the wool-wrap (takes the place of flame-retardant chemicals) are both certified organic by GOTS. Savvy Rest all-latex mattresses can have your choice of organic dunlop or natural rubber talalay latex. Savvy Rest’s all-organic-latex mattresses, the Serenity and the Tranquility can be customized for firmness on each side of queen sizes and larger. In addition, each side of the mattress can be adjusted separately for firmness. Plus Savvy Rest allows customers to exchange latex layers for those of a different density during the first 90 days of ownership. These great features ensure that your mattress will be perfectly comfortable for the differing needs of you and your sleeping partner. Each sleeping partner will love having their own choice of comfort. 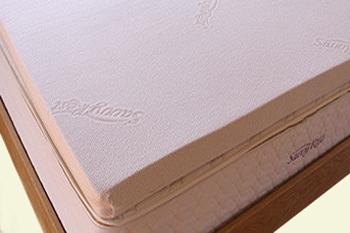 Savvy Rest’s natural latex organic mattresses are made with layers of soft, medium or firm latex foam rubber. The Serenity has three layers of your choice and the Tranquility has two layers of your choice. The Layers can be dunlop or talalay. Are you tired of mattresses that develop a body impression in less than six months? The Savvy Rest warranty specifically guarantees that the natural rubber latex mattress will not sag nor take a significant body impression for twenty years. We also sell an organic innerspring mattresses by Savvy Rest. We also sell an organic latex crib mattresses by Savvy Rest. We also sell an all-wool mattresses by Shepherd’s Dream. Natural rubber latex toppers are the most long-lasting and compression-resistant toppers available. Natural rubber latex is known to be highly resistant to taking a body impression. No need to rotate or flip the topper. You can get 20 years of comfort from your latex topper. And although a topper’s main purpose is to soften an overly-firm mattress, it can also firm-up a mattress that is too soft as long as the mattress is not sagging. We have two organic latex toppers by Nature’s Embrace and one natural rubber talalay topper by Savvy Rest in our showroom. The Savvy Rest Vitality Topper has an organic, knit cotton casing with a two-and-a-half inch thick layer of soft natural talalay latex inside. Talalay latex is extra soft and very good at reducing pressure points, which makes it very useful for side-sleepers. This topper can give the firmest mattress a plush, cozy-soft sleeping surface. The Nature’s Embrace toppers have a two-inch layer of organic dunlop latex available in either a soft or medium density. They also sport either an organic cotton cover or an organic cotton with wool cover. These are designed to add an extra layer of comfort to any mattress. 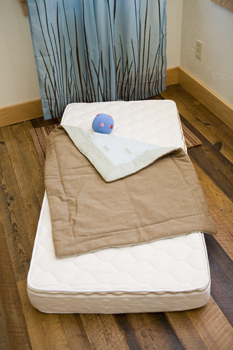 Visit ECO Sleep Solutions of Eugene, Oregon and try all three! ECO Sleep Solutions, Inc. of Eugene keeps in-stock the Savvy Rest organic dunlop latex crib mattress. This wonderful organic latex mattress is made from five-inch-thick, firm organic dunlop latex. 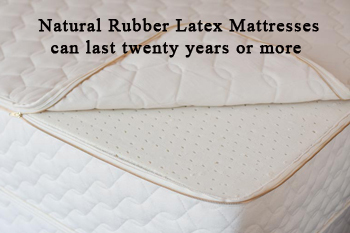 It has an organic wool and organic cotton casing, just like the full-sized Savvy Rest natural rubber latex mattresses. Here is a positive testimonial about Savvy’s organic latex crib mattress from a couple’s website titled Young House Love. We also have for baby organic cotton crib sheets, wool mattress pads, puddle pads, wool crib comforters and organic cotton crib blankets. Many consumers are aware that toxic chemicals in the home, including those in mattresses, bedding, sofas and other furniture, are dangerous to one’s health. Chemical flame retardants have been linked to cancer, obesity, infertility and developmental brain disorders. Along with other unsafe chemicals in synthetic foams and textiles, they off-gas into indoor air and degrade into easily-ingested dust particles. Exposure to these compounds has resulted in unprecedented levels in our bodies, with children carrying the highest load. Nontoxic, natural latex foam mattresses and sofas without flame retardants offer a healthful alternative. NOTE: Like all latex mattresses, this organic latex crib mattress needs a rigid support base. Unfortunately, most cribs are not made with rigid support for the mattress. If your crib has mattress support with a lot of give, or made of flexible wire, consider putting about five or six slats underneath the latex mattress so that it is supported properly. Just as a reminder, natural rubber latex is a plant-based material. You can feel confident that it a good place to rest your head every night. 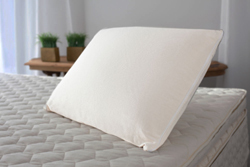 We carry natural talalay and organic dunlop latex pillows by Savvy Rest, among others. Having the right pillow is nearly as important as having the right mattress. And it is important that the pillow “match” the mattress and your sleeping style. In general, a softer mattress requires a lower pillow than a firmer mattress. Another basic consideration is that side-sleepers tend to need higher pillows than back-sleepers. So when you come into ECO Sleep Solutions of Eugene, Oregon to pick out your pillow, test it first in the position you normally sleep in using one of our mattresses that most closely resembles your own mattress. 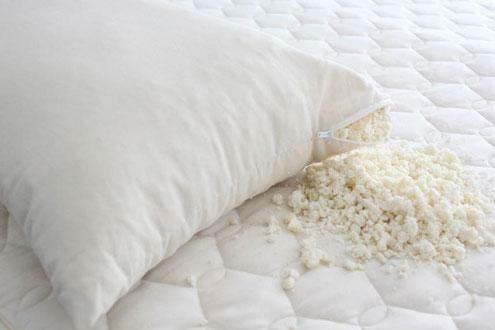 Our shredded latex pillows provide great comfort and support. The shredded latex pillows are the ultimate in malleability and are also adjustable in height. Our talalay latex pillows are formed-latex that is super-soft with plenty of loft. Like all our pillows, they have an organic cotton cover. Talalay latex pillows provide uplifting support to your neck and bottomless pressure relief for your head. Our luxurious Talalay pillows come in high profile and low profile designs. The high profile pillow is ideal for a side sleepers and the low profile pillow is good for back and stomach sleepers.